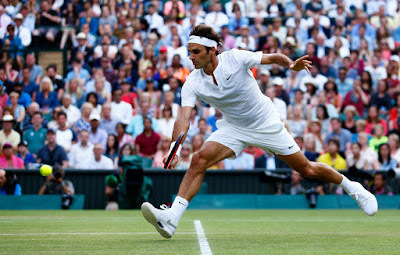 Seven-time Wimbledon champion Roger Federer dismissed No. 20 seed Roberto Bautista Agut 6-2, 6-2, 6-3 on Monday for a spot in the quarter-finals. Federer has now reached the quarter-finals at the All England Club for the 13th time and his 45th Grand Slam quarter-final overall. The second seed converted both break point opportunities to grasp a one-set lead after 21 minutes. An early break in the second set gave Federer a 2-1 lead. Three games later, Bautista Agut rolled his ankle, requiring a visit from the trainer. The World No. 2 went on to win the second set, with 12 winners in his favour. Federer again dominated the third set, winning 100 per cent of points off his first serve and hitting 16 winners. The Swiss broke Bautista Agut to clinch victory after 86 minutes. “It was nice to play a baseliner after two big servers. I did a nice job making the transition,” said Federer, who overcame Sam Querrey and Sam Groth in the previous rounds. “Clearly I felt I had more time on the return and was still able to play aggressive tennis, committed on the return as well. “It was a good match,” said Federer. “I got off to a good start and kept rolling. Maybe Roberto wasn't at his very best. Midway through the second set, he hurt himself. Still, he was out there and he was actually still moving okay, so I had to put him away, which I was able to do. The Swiss will take on No. 12 seed Gilles Simon, who earlier ousted sixth seed Tomas Berdych 6-3, 6-3, 6-2. Simon improved his ATP Head to Head record against the Czech to 7-4 as he reached the Wimbledon quarter-finals for the first time to equal his best Grand Slam result. The 30-year-old Frenchman fired 21 winners and saved the only break point he faced in the one hour, 56-minute match. Federer leads Simon in their ATP Head to Head series 5-2. It will be their first meeting at Wimbledon. “I'm not going to look further than Simon who has caused me difficulties in the past. I played him tough in some of the majors, Australia, French Open, we played five sets both times there. That's my focus really right now,” Federer said.